St. Luke’s Church of Smithfield, Virginia dates back to 1632. 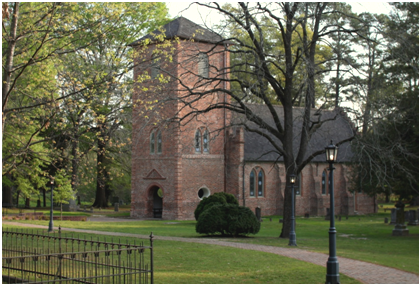 As the oldest surviving Gothic building in the United States, St. Luke’s is a historical landmark that is very significant to the Smithfield community and surrounding area. Despite being carefully preserved by a dedicated group of volunteers, St. Luke’s is cracking and settling. Like many historic buildings, St. Luke’s lacks any real structural documentation, so how much damage the building is incurring over time is largely unknown. Furthermore, if the church incurred any significant damage from natural disaster, it would be very difficult to restore this important historical landmark of the community. New River Kinematics acccomplished this project with the help of Ron Hicks and Ryan Grelinger of API Services. Hicks and Grelinger generously donated their time and the use of their instruments on a sunny spring day in April 2012 to scan the exterior and interior of the church. The primary workhorse of the operation was a special scanner produced by Surphaser that is designed to take millions of distance measurements as it slowly rotates on a heavy tripod. The Surphaser is well-suited for this task since it has the capability to measure a range from .2m to 70m, providing ultra-low noise sub-millimeter data at a rate of up to 1.2 million measurements per second. Although St. Luke’s is relatively small for a church, it is not a small building. 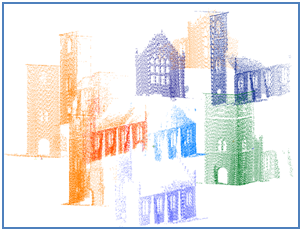 Much like with a camera, the scanner cannot visualize the entire church from one position. In fact, the scanner had to be moved through 13 stations to fully visualize the exterior of the church and an additional 9 stations to scan the interior. 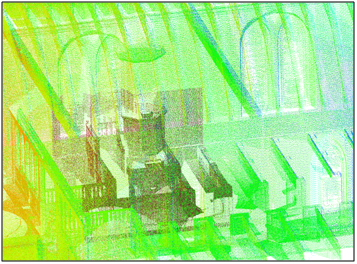 The beauty of a scanner is that it can essentially paint the surface of the church with measurements. However, like a spray paint can, a scanner does not necessarily hit every point you want to measure. There are areas that are well covered and areas that are missed, depending on how the spray of measurements hits the church. To fill the gaps, a Leica Total Station TDRA6000 was utilized as well. The total station is like a theodolite regularly used in construction projects, except it has the added benefit of delivering a range measurement, as well as an angle and inclination, at a very high accuracy. 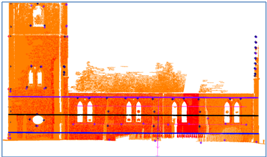 Like a jigsaw puzzle, each of these scans and total station measurements must fit together to create a 3D representation of the church that can be later used for its inspection and repair. Traditionally, these scans have to be independently registered together in order to analyze the 110 million point measurements taken in the 22 scan stations and total station measurements. However, SpatialAnalyzer® (SA) provides a number of simplified solutions and powerful tools to accelerate this process. There are many ways that SA can fit scans together. For example, in many industrial measurement situations, tooling balls are placed in the view of each of the scanner stations. 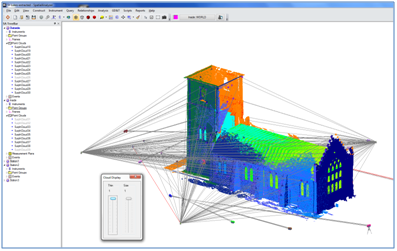 SA can automatically search the scan data, extract the exact center of each sphere, and align the scans based on these “control points.” Alternatively, if a CAD model of the church existed, the scan data could be quickly aligned to the model. However, in this case without a reference model or location points, Will and Ron employed an even easier method. They used a third instrument, an API T3 Laser Tracker to take measurements of each scanner location while still in the field, a process known as “Smart Scanning." Using SA, the scanner was located through the use of the laser tracker before starting each new scan. To do so, several tracker measurements were taken from location points placed on the scanner. This was made easy through the use of SA Remote, an iOS phone app that functions as a remote control for the tracker. This allowed users to walk to the scanner, set an SMR in a locator on the scanner, use SA Remote to trigger a tracker measurement, and continue through the measurements. The greatest advantage to locating the instrument prior to taking the scan measurements (rather than returning to the lab with a scatter of unregistered scan data), users can observe the scan in SA in real time, in a registered position. This allows for real-time monitoring for areas of low scan coverage and provides the opportunity to make decisions in regards to the need for additional scan locations, preventing return trips to fill data gaps. 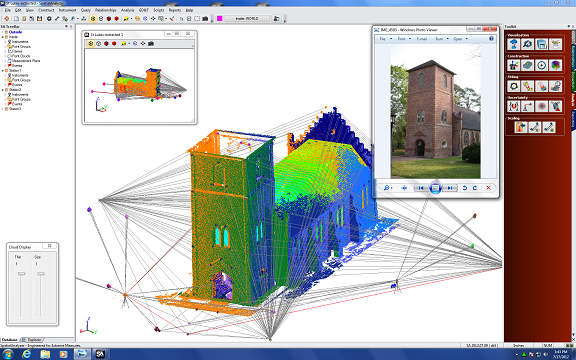 After the entire scan of both the inside and outside of the church (a process that took less than six hours), the resulting file contained 110 million point measurements (a data set easily handled by SA’s 64 bit version) from 22 scan locations, all aligned to a unified coordinate system. Back at the lab, SA’s Unified Spatial Metrology Network (USMN) feature was used for instrument shot error estimates and advanced fitting techniques to further refine the instrument locations and hone in the measurements to their fullest capability. Once assembled in the software, the church can be literally picked up and rotated to be viewed from any perspective. SA provides a suite of tools to enter the church clip to the points of interest and visualize its internal structures for detailed analysis. In this case, a simple floor plan was first constructed by building a virtual plane through the church and filtering the scan data within a certain proximity to the pane. Doing so created a true measurement of wall thickness and placement at the height of that plane. This was done at several heights throughout the church, creating a layout of both the church and its internal structures. This provided a sub-millimeter measurement of the placement of the internal structural components such as the pews and pulpit in relationship to the walls, columns, and supports. 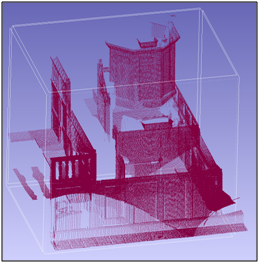 An advantage of the complete scanning approach is that any particular aspect of the structure can at any time be extracted and examined in greater detail. For example, if fire damaged the pulpit inside the church, it would be possible to rebuild these structures based on the scan data of these feature alone. SA allows users to draw a clipping box around any particular set of data and isolate it, so that only data within this defined box of clipping planes is shown. The box can then be easily moved about the data, expanded, and contacted while acting as a magnifying glass to capture only the relevant data to the particular analysis. This data can then be sub-sampled to create another file that can create dimensions, measure angles, and recreate these features. An example of the power of this tool is shown below. On the left is a picture of the pulpit shown within the other scans. On the right is a view of the pulpit utilizing the clipping planes tool. Future plans regarding the preservation of St. Luke’s Church include an additional scan later this year and subsequent scans in the years to come in order to analyze changes in the structure of the church. Since a full scan has been completed, only a quick subsample of measurements will be necessary for comparison to the master data set. Should major shifts in the church occur, they will be easily recognizable through comparison to this original data set and steps can then be taken to protect this priceless historic site. Click here to read API Service's blog entry on this project.